It’s been long time since the last time we made homemade Maamoul. I even can’t remember when that was exactly. Definitely more than 10 years ago when we used to live next door to my grandmother’s house, where my aunts, mother and grandmother would gather days ahead of Eid. Each one of them would bring her share of Maamoul ingredients and different shapes of Maamoul molds. They would sit on the kitchen floor making a circle; each of them is responsible for doing a certain step of the whole process repetitively. Kneading, rolling, stuffing, molding, baking, packing… I wish I had a single picture of all this. Holding this memory, I’ve always had the impression that making Maamoul requires a number of people and a long time. The impression has changed just yesterday when I’ve decided to try to make stuffed date maamoul by myself with some help of my mom. The whole process didn’t take more than two hours. And a good time was already wasted in trying to convince my mom to make it in the first place. “Only for the sake of the blog” she kept saying! The recipe I’m sharing with you in this post is provided by the cook of the Palestinian Cultural Center in Amman. They make the best yet the healthier Maamoul in town. 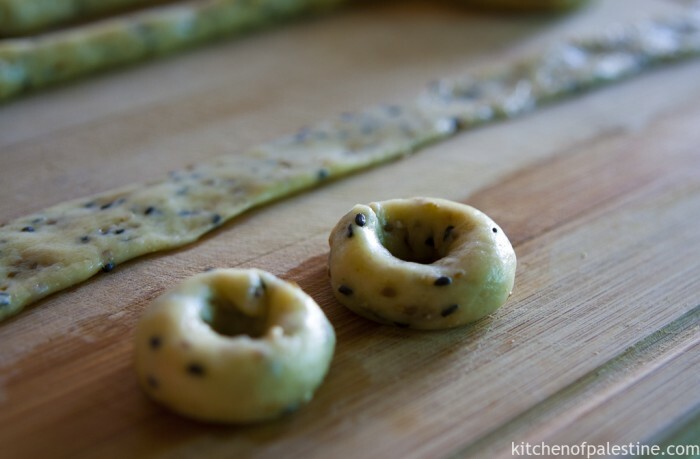 For the dough: place flour, olive oil, sesame seeds, anise, black seeds and instant yeast in a medium-size bowl. Rub the mixture using both hands and knead the dough until oil is well combined into the flour. Place the mixture in the refrigerator for a while. (In some recipes, it's left in the refrigerator for overnight. I only leave it for half an hour). Add 1/3 cup of water gradually to the mixture while kneading. Keep kneading the dough until it's well combined. (Add more water if the dough is too dry or flour if it is too sticky). Cover the bowl with plastic bag and leave it for about an hour to rest. For the stuffing: combine date paste, anise, and cardamom and mix very well. 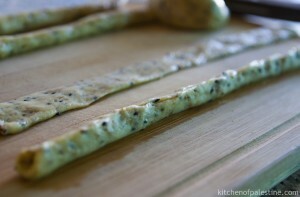 cut the dough into several pieces and roll them into snake shape (roughly half cm). leave a side. For rolling and filling process: cut the dough into ten pieces. 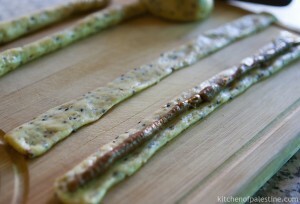 Gently roll each of dough pieces into a snake shape, then make it flat with your hands (roughly 1 cm thickness). Fill it with date paste pieces (as in pictures). Fold the dough and seal the edges very well. Using a knife, cut stuffed dough into 2 cm pieces. 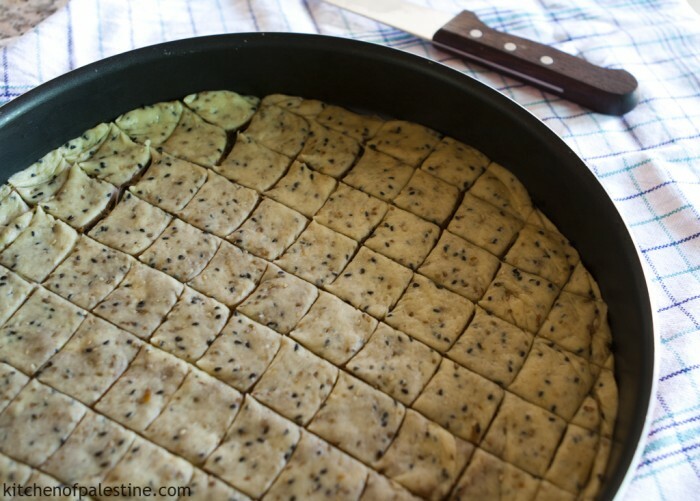 Bring both corners of each filled-dough piece together in order to make the final form of maamoul. Place them in an oven tray and put it in a preheated oven (180 degrees Celsius in the middle level rack) for a total of 15 minutes, 10 minutes for below side and 5 for above side or until they barely start getting golden. (Be aware not to over cook them). Take them out of the oven, let them cool and then place them in a closed container. *If you can't find date paste in stores, place some dates in a food processor and you will get homemade date paste. That easy! 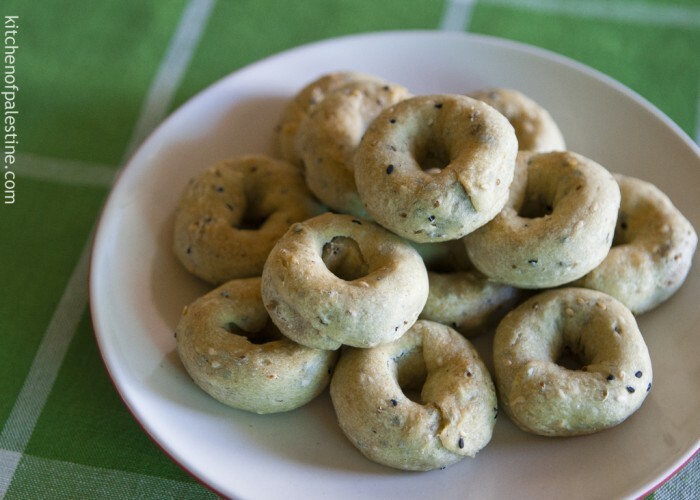 If you lost your patience forming those maamouls/cookies or ran out of time, have a look at the lazy version of making them. It's super awesome, easy, relatively quick. Basically its a layer of thin maamoul dough, a thin layer of date paste, and another layer of a dough. Placed one over the other in an oven-proof tray, and cut into small square pieces. 14 Comments on "Stuffed Date Maamoul"
Good job! I would like to try your knafeh recipe.. I have never tried to make homemade knafeh, probably because it’s available everywhere here. will try this out..looks delicious.. but i thought maamool was made with semolina flour? and no sugar in the dough part of the recipe? That’s true. It’s commonly made with semolina, but it can be made with all purpose flour as well which I prefer using. As for the sugar, the date filling is too sweet already and I think it doesn’t need any sugar at all. Thantk you for the recipe!! very delicious !! you should post more palestinian sweet recipe !! Thanks Caroline. Yes I should! The list is long.. Do you have any particular recipe in mind? Hi, I am Mexican but I love to try new recipes. I like your website. Today I am trying to make maalmoul! I love middle eastern food. Does anyone know what “black seed” would be called here in the United States? I am with Friends of Al Aqsa and we were hoping to use this recipe for our upcoming newspaper? Yes of course. Feel free to use as many recipes as you need. Thank you so much your stuff is truly amazing.